This is not a doctored photo. It came from an article in Africa Geographic. If this doesn't send chills down your spine, you are a braver man than me. All I can say is that I am sure glad that Lake Michigan is sharkless! I can't stop looking at it! It freaks me out, man! Looks like a good time to practice his reverse-sweep roll, eh? No? 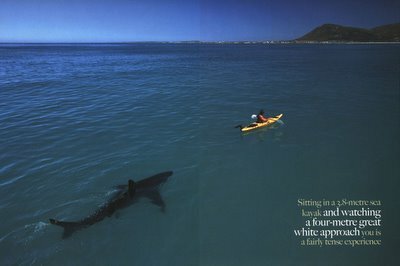 I bet he was glad he left the Skin on frame boat home that day! Ya know it makes you think that if there were similar sharks in the Arctic those kayakers would've been prey. Can you imagine paddling around in a seal-skinned kayak waterproofed with seal fat! Your basically a large seal to sharks. I've seen that before but figured it was doctored, but it appears not.